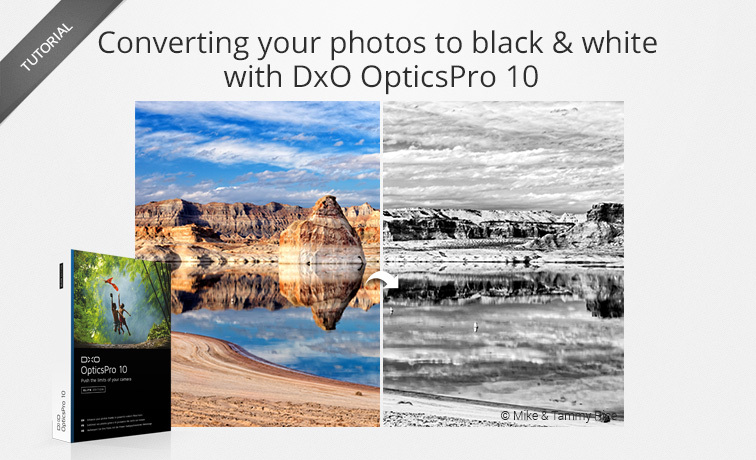 Black & white has its place in DxO OpticsPro 10, which provides a certain number of conversion presets. The majority of them offer a creative rendering, but you can also use them as a basis for conversion that you can then rework and modify using the Contrast or the Tone curve tools. You will learn the basics about black & white conversion, which lead you progressively to develop and create your own renderings. 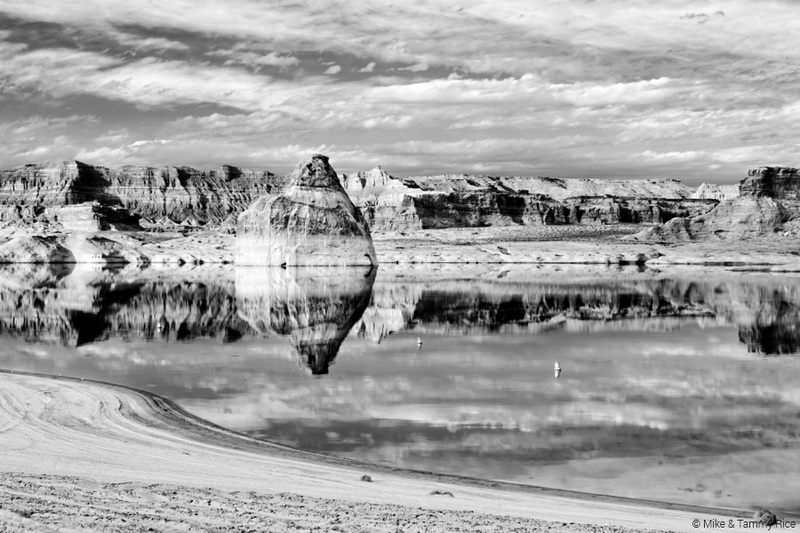 The advent of digital has completely changed photography, and more particularly black & white photography which, against all odds, has seen a spectacular resurgence in popularity over the past several years. The reason for this is very simple: cameras and software offer a flexibility of use that one could scarcely dream of in the darkroom, not to mention the availability of high-quality printers that allow photographers to print on their choice of a vast and growing selection of photo paper. Today, black & white photography usually starts off with a color shot. Why? Because image processing programs are designed to maximally exploit the information contained in an image to provide quality black & white conversions. Photographers can then use those images as a base on which to deploy all of their creativity to produce unique black & white images. Of course, an easy solution is to program the camera to take photos in black & white. But it would be a shame to bypass what a software application such as DxO OpticsPro 10 can offer. And, too, as with all third-party RAW image-processing software, the black & white setting of the camera is not taken into account, and thus it is a color image that will end up being opened in the application. As soon as you open your image in DxO OpticsPro 10, the DxO Standard preset is automatically applied to the photo. This preset is a collection of basic corrections that affect exposure, contrast, color, noise, and sharpness. Click on the Apply preset button in the upper right in the toolbar. 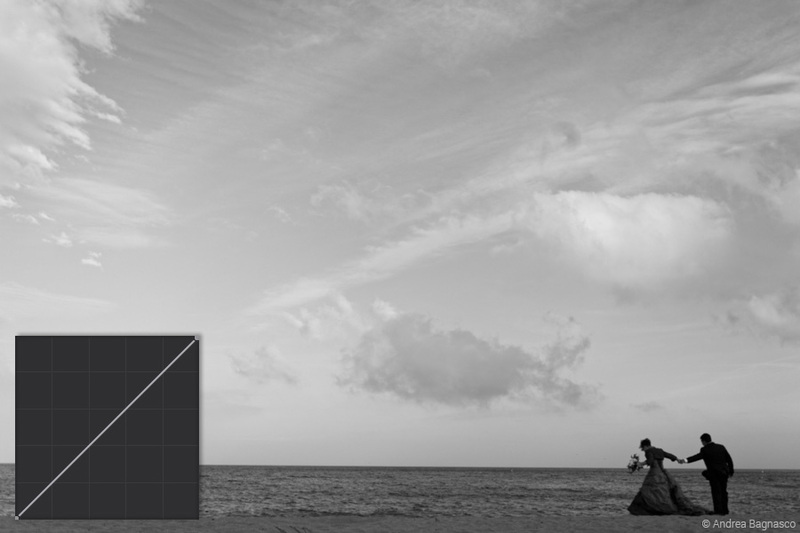 In the presets window, select preset 3 – Black & White, in the General purpose presets section. 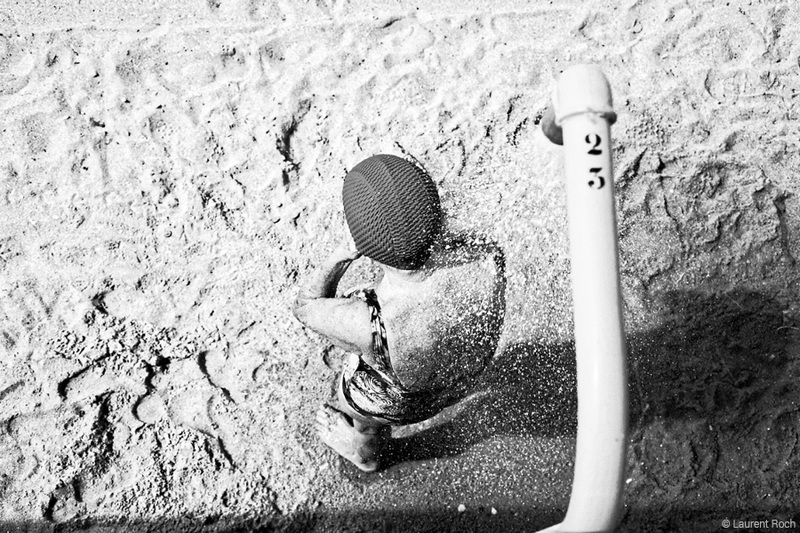 The image is instantly converted to black & white; this action is reversible, of course. You can also access the presets by right-clicking on the thumbnail in the file browser, and then selecting Apply preset in the context menu. 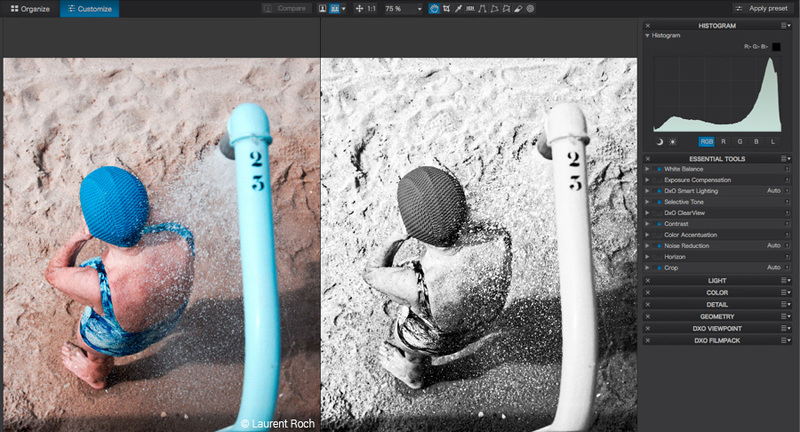 In the presets window, go to section 2 – Black & White, and choose one of the eight available presets. Your image is converted to black & white, and this action is also completely reversible. 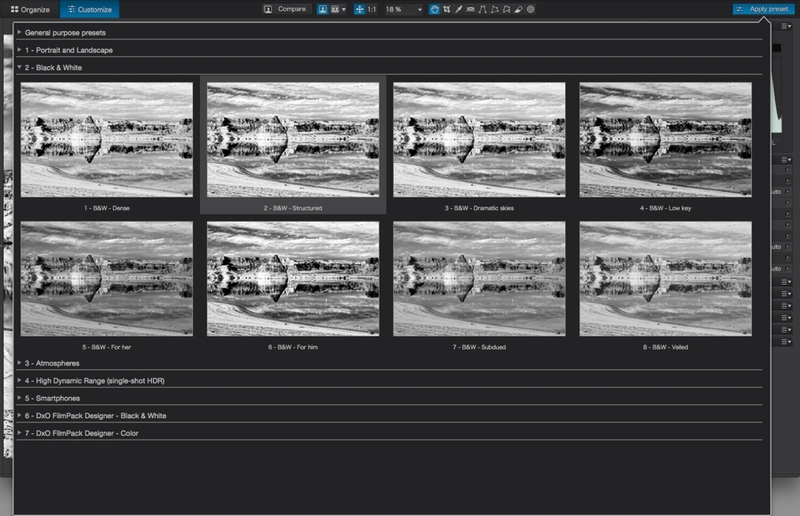 DxO OpticsPro’s black & white presets are “partial” presets — that is, their corrections are added to, or in some cases replace, those of the DxO Standard default preset. After applying the black & white preset, you can modify the rendering by using a certain number of tools in the Customize tab. Even though the corrections can be adjusted for any preset, it is best to do so with the general purpose preset, because it provides a neutral basis for work, rather than working from the creative presets in the Black & White section. You can adjust the general contrast level of your image in the Contrast sub-palette (in the palette Essential Tools or Lightpalettes). Set toward the left, it will progressive reduce the brightness distance between the dark and light elements in the image, gradually transforming the photo into a flat image with a soft aspect. Set toward the right, the slider will progressively accentuate the difference between the dark and light elements in the image: the darks become darker and more dense, the lights become even brighter. The image will become very hard, with many blacks and many whites, but few subtle variations among the grays. Set toward the left, it will soften and then progressively blur details and textures, making your black & white image overall more soft and diffuse. Set toward the right, it will amplify the presence of the details and textures, thus making the image harder. The Tone curve is a powerful tool for adjusting contrast, whose use is demonstrated in detail in our dedicated tutorial. 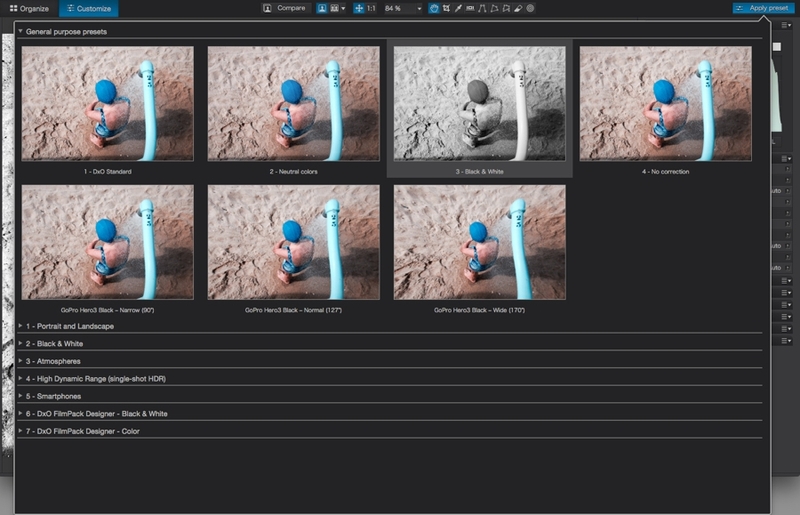 Located in the Light palette, it will let you modify the contrast of your image in a much finer and more selective manner, by setting control points, or by changing the thresholds at the bottom of the curve (0 – blacks) and/or at the top of the curve (255 – whites). 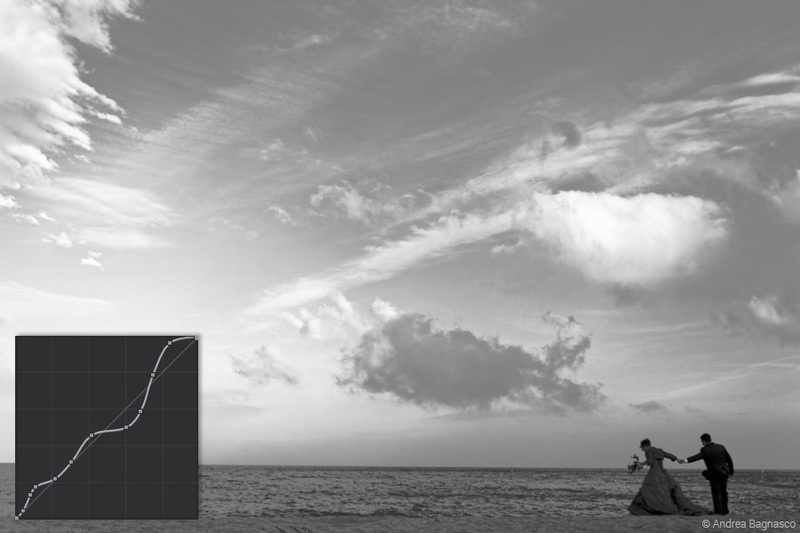 To use the Tone curve to modify the black & white rendering of your image, stay in RGB mode. If you choose one of the individual three channels (R,G,B), you will introduce the corresponding color dominant. When you have finalized the black & white rendering of your image, don’t hesitate to save it as a custom preset, as explained in our dedicated tutorial.